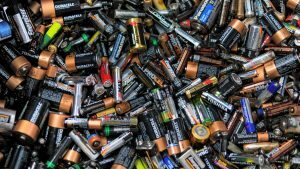 At the Recycle Depot, we collect tons of batteries every year. In fact, in 2016, we collected over eight tons! In case you’re wondering, that is the equivalent of eight African elephants. Batteries are one of the most complicated and hazardous categories of waste we work with at the Depot. Every household has batteries, but few of us realize the variety we use and the materials that go into their manufacture. Metals such as mercury, cadmium, lead, lithium, silver, copper, nickel, and zinc have value and can be reused; that’s the most important reason to recycle them. Reusing these metals is less costly to our pocketbooks and the environment than mining them. However, dumping batteries in a landfill—or worse, on the ground or in a stream—is not only wasteful, but dangerous. For instance, it takes very little lead to contaminate a lot of drinking water. Don’t even get me started on the toxins released when people burn batteries. You can drop off all your batteries at the Recycle Depot. If you can, presort them into separate containers based on the type. Depending on the chemistry, batteries take various paths for recycling. 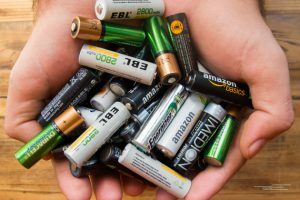 Most should come to the Depot for disposal, with one exception: alkaline batteries can be thrown away in Indiana according to current waste laws, though they can be recycled, too. Regular rechargeable batteries: great for handheld games, flashlights, and clocks. We prefer these at my house because they are easy to recharge with a device you can buy at any hardware store. Their use cuts down on the amount of one-time-use alkaline batteries we buy. They do wear out over time, however, and should not be thrown in regular trash. Nickel-Cadmium rechargeables: Ni-Cads are used in a lot of portable devices, such as phones and cameras. They contain cadmium, a metal that’s toxic even in small quantities. Burning these batteries can release toxic vapors. Rechargeable Lithium-Ion: Li-ion batteries come in various applications, from laptop computers to power tools. They can be flammable, and have led to the recall of at least one type of cell phone, the Samsung Galaxy Note 7, because of their tendency to burst into flame. Rechargeable Nickel Metal Hydride: these usually come in a plastic-wrapped cell pack for use with hobby vehicles, cameras, and other handheld electronics. Many of the single-use batteries we have around the house are also hazardous, such as the tiny button-cell batteries used for hearing aids, watches, and some medical devices, and some of these batteries may contain mercury. Single-use lithium batteries can overheat and explode. Vehicle batteries: most are lead-acid batteries and can be corrosive if spilled. We take them for recycling at the Depot, and some auto repair or parts shop will also take them back if you’re buying a new one. Everyone has batteries around the house, because we are a society that increasingly runs on devices. Don’t toss your batteries, but keep a box handy to put store them in until your next trip to the Depot!